LG Electronics (LG), co-developer of the ATSC 3.0 next-generation television broadcast standard, confirmed that all LG 4K Ultra HD TVs now on the market in South Korea already incorporate ATSC 3.0 tuning circuitry. 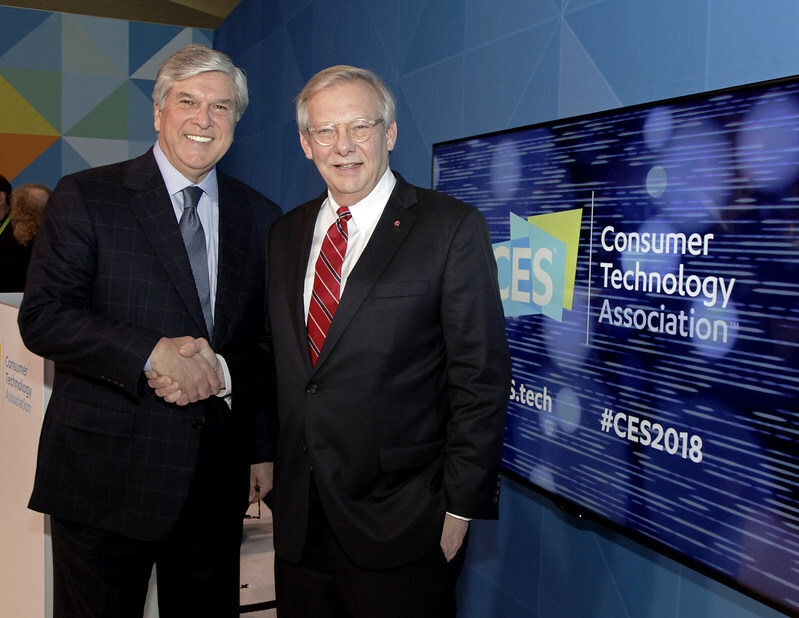 At CES 2018, National Association of Broadcasters President and CEO, Gordon Smith (left), congratulates LG Electronics USA Senior Vice President, John Taylor, for the companys pioneering work behind the ATSC 3.0 Net Gen TV standard. At CES 2018, where the Advanced Television Systems Committee (ATSC) officially released the new suite of standards, LG announced plans to support broadcast trials and early deployment testing in the United States during 2018. Korea adopted the Next Gen TV standard in 2017 and leading broadcasters KBS, MBC and SBS launched ATSC 3.0 broadcasting in advance of 4K UHD transmission of next month’s 2018 Winter Games in Pyeongchang. Since last fall, all new LG 4K UHD TVs and most new LG smart TVs sold in Korea have included dual ATSC 3.0-ATSC 1.0 tuner chips. To support initial U.S. Next Gen TV broadcast deployments, LG said it will leverage its marketplace experience from the launch of Next Gen TV in Korea and its technical expertise as co-developer of ATSC 3.0, which has been hailed as the world’s first Internet Protocol-based TV broadcast system. The U.S. Federal Communications Commission approved key elements of the ATSC 3.0 broadcast standard in November 2017 for voluntary implementation of Next Gen TV. “The flexible, extensible new ATSC 3.0 standard will unleash an innovation revolution, marrying broadband and broadcasting to deliver a range of new services for consumers in Korea, the U.S. and around the world,” said Dr. Jong G. Kim, Senior Vice President in the Office of the CTO, LG Electronics. Development of ATSC 3.0 technologies represents the latest digital television innovations by LG and Zenith, long-time supporters of U.S. terrestrial broadcasting, including the A/153 Mobile Digital TV Standard adopted by the industry in 2009. Zenith developed the core transmission system at the heart of today’s ATSC 1.0 A/53 Digital Television Standard, approved by the FCC two decades ago.